Express Yourself Artshop, the art program I work with focusing on providing art instruction for adults with disabilities, runs mostly on donations. Because of this, I’ve gotten used to brainstorming how to transform materials not commonly used in art into something awesome. Though I appreciate sculpture, my passion definitely lies in creating 2D art. However, 2D doesn’t always have to mean “flat” – and that’s where mixed media comes in. Mixed media literally means “the combined use of 2 or more media”. Many times, it involves assembling multiple non-flat elements to a drawing or painting, working them into the overall composition. Knowing how to add all these extra elements in an effective manner, as well as recognizing when to stop so that the piece doesn’t become a massive junk pile, can be intimidating on the first go. 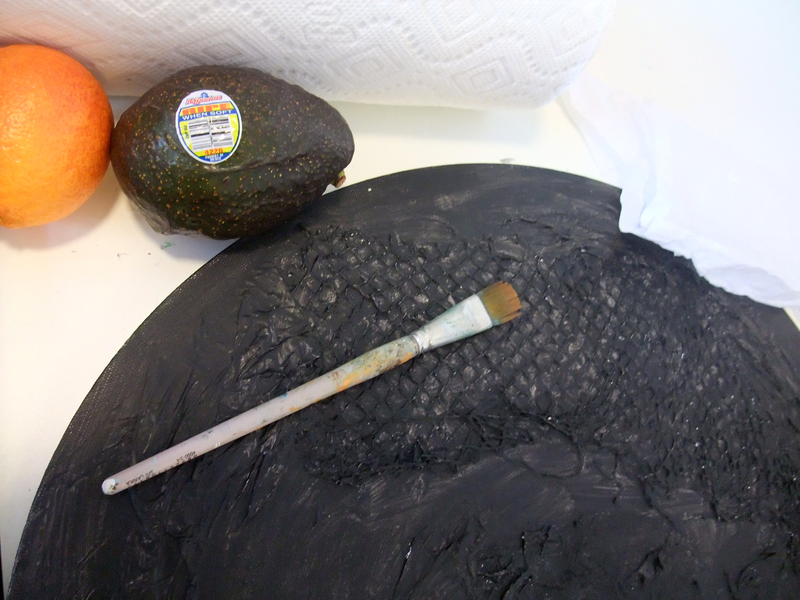 An easy way for an artist who has never worked in mixed media before to dip their toe into the genre is by simply creating texture on their work surface, and then drawing or painting over it as they would were they using a flat canvas. The effect is something far more extraordinary that draws the viewer to come closer and really examine the finished piece, touch it even (if you allow it). The main component you will need is a bottle of gesso; a white, thick, paste-like paint that can also be used to cover over used canvases. It can be pricey, but lasts a long time. This is the only thing you will need to purchase. Everything else used to create texture can be common household materials. Paper towel, especially if it has a pattern imprinted on it (you can use that! ), is great as well as tissue paper. Are you an avocado or citrus fruit enthusiast? You know those net bags they come in at the grocery? Those are simply fantastic. 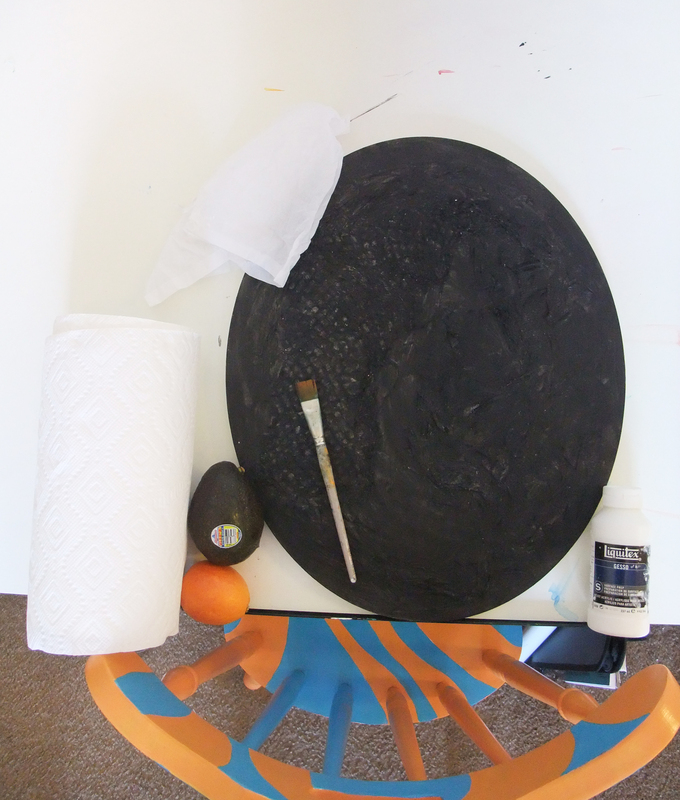 Once you have your materials, lay them out on your canvas and pile on the gesso. It will act as a glue, but takes awhile to dry so don’t hesitate to manipulate, move, crinkle, your materials as you are covering them. After a few coats, you will have a paintable surface. 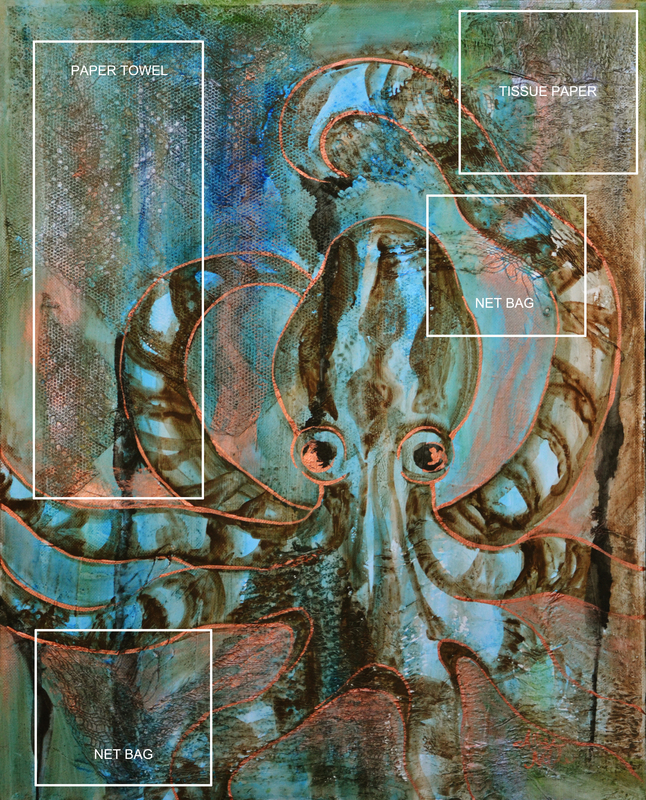 For the octopus painting shown below, I used liquid watercolor. Watercolor is great because it will show darker on the textured areas and lighter on the flat areas, accentuating the visual texture. This next piece I’m trying with the black background I’m doing in acrylic this time. Play around, make some samples on cardboard until you find something you like (old cereal boxes work great to experiment on), and keep on the lookout for interesting textures in your everyday environment – they could come in handy for your next masterpiece! New textured work, in progress. Closeup, texture achieved using a net fruit bag and wrinkled tissue paper. Gilded Creatures, 16×20 mixed media, and one of my more popular pieces – Behold, the wonders of gesso!